Immediately following the conclusion of UFC 211, pundits did as pundits do, looking for ways to quantify and contextualize the impressive achievements of UFC heavyweight champion Stipe Miocic and UFC strawweight champion Joanna Jedrzejczyk on Saturday. More than one outlet proclaimed Miocic the UFC’s greatest heavyweight of all time, while analyst Kenny Florian boldly stated that Jedrzejczyk is already right there as the best female fighter ever. Such pronouncements are debatable, of course. Some might also say they are a bit premature. When assessing historical greatness, we often need the benefit of time. And when it comes to age and sustained excellence, nobody on the UFC 211 card has done it like Frankie Edgar, perhaps the most underrated and underappreciated fighter in UFC history. On Saturday night, he beat the bejesus out of a young and flashy burgeoning star, Yair Rodriguez, and then explained the blowout in an equally economical manner. “There are levels to this,” he said. After Saturday night’s master class, it’s fair to say that Edgar has quietly put together one of the best 10-year stretches in UFC history. In fact, an argument can be made that of all the fighters ever to grace the Octagon, he has the second-best decade-long stretch of anyone, behind only Georges St-Pierre. While scores of fighters have reached subjective levels of greatness in the UFC, true longevity has proved elusive at the elite level. A look at some of the biggest names proves that. Tito Ortiz debuted in 1997. By the end of 2007, he’d had multiple surgeries, gone winless in his last two fights and was largely believed to no longer be among the light heavyweight’s elite. Chuck Liddell debuted in 1998. By the end of 2008, he’d lost three of four (including two by knockout) and retirement whispers had begun. Ken Shamrock hit his decade mark losing three of four. 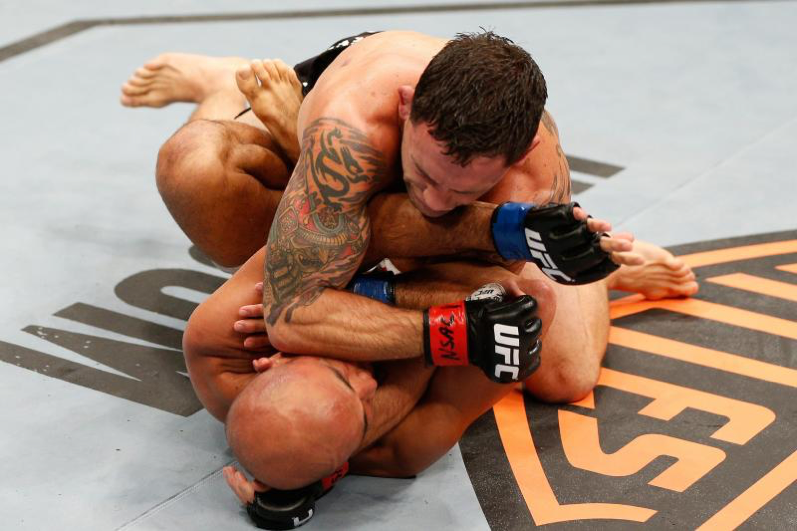 Even the great Anderson Silva ended his 10th UFC year with his fourth loss in five fights. In a sport that is exceptionally demanding on the body, that prizes speed, that features an ever-changing learning curve and that hastens the inability to absorb head trauma, such career arcs are more the rule than the exception. Edgar, who debuted in February 2007, is currently 10-plus years deep. Yet during a career in which he’s ignored the common practice of extreme weight-cutting by fighting near his natural size, Edgar has never been blown out, knocked out or submitted. His resume of wins includes a list of lighter-weight luminaries: B.J. Penn, Urijah Faber, Chad Mendes, Cub Swanson, Gray Maynard. Perhaps most impressive for Edgar is that after his only career drought, a three-fight losing streak from February 2012 to February 2013, he rebounded impressively and has won seven of his last eight fights since, including four by finish. After 10 years in the UFC, Edgar is 16-5-1, ranks second in his featherweight class and is still performing at a peak level. This kind of sustained success would have been impossible to predict when Edgar debuted at UFC 67 as a heavy underdog to hot prospect Tyson Griffin, only to emerge with a unanimous-decision win. If the upset itself wasn’t enough of a sign, his ability to withstand the pain of a late-fight kneebar attempt should have alerted us that we were watching someone special. The totality of his career shows that he deserves consideration for the best pound-for-pound fighter in UFC history. While many fighters draw every ounce of water from their bodies in order to compete in the lowest possible division, Edgar often fought without cutting more than a pound or two. Of his 22-fight UFC run, he has never been the taller man in the matchup. Not once. Because unofficial weights are not recorded, it’s impossible to know if he was the true smaller man in every matchup he’s ever entered, but it’s almost a lock. Who might have been lighter than him? Perhaps Hermes Franca? He himself has said on multiple occasions he’d be able to make the bantamweight 135-pound limit; he just never quite felt the need to. His heart is beyond question. Anyone who watched his trilogy with Gray Maynard will forever have those first-round sequences etched in their brains, Edgar somehow bouncing back from guaranteed defeat on multiple occasions. Those courageous displays are legendary, but Edgar should also be revered for his professionalism in a sport that often ignores polished professionals in favor of counterculture wild cards. His low-key approach serves as a reminder that greatness can be achieved in any number of ways. He has excellent basics and mechanics, from striking to wrestling to jiu-jitsu, leaving no obvious holes for opponents to game-plan against. He always appears to be in great shape. His gas tank is unending. His surrounds himself with top coaches. He’s never tested positive for performance-enhancing drugs or even been a subject of rumors. Offensively, he certainly has his favorite techniques, from feints and jabs to the body shots setting up level changes to the knee pick, but he’s always added new tricks, from wheel kicks to new takedown setups and beyond, and that evolution is the best explainer for Edgar’s continued success. As far as 10-year UFC stretches go, only St-Pierre could demonstrably boast of a better run. He first competed in the UFC in 2004 and, at the end of his decade with the promotion, had gone 20-2 while holding the welterweight championship twice. Randy Couture also has a strong case. He went 12-5, and as his 10-year UFC anniversary hit, he defeated Tim Sylvia for the UFC heavyweight championship. Edgar’s run stands right alongside theirs, having experienced frequent success while never suffering a noticeable deterioration of skills. Others may one day rival or exceed him. Demetrious Johnson has won 12 straight fights in the UFC and is a dominant champ, but has to put in four more years to complete a decade. Jon Jones has a brilliant fight resume but has another year-and-a-half to go until hitting the 10-year mark, and with a rough recent stretch behind him and a Daniel Cormier rematch approaching, his future narrative is anyone’s guess. Other champions like Conor McGregor (9-1 in four years with UFC) Jedrzejczyk (8-0 in three years with UFC) only have to look as far as Ronda Rousey to see how quickly legacies can unravel. Edgar? He just keeps on ticking. During his time, we’ve watched the shuttering of the WEC, Strikeforce and Pride, we’ve seen the “Machida Era” and “TRT Era” come and go, the rises and falls of Brock Lesnar and Rousey, the addition of women’s divisions within the Octagon, the sale of the UFC from the Fertittas to WME-IMG. A lot has changed. But one thing has remained rock-steady, and that is this: When Frankie Edgar signs to fight another bout, he’s going to train like a madman, he’s going to bring hell with him, and when it’s all over, he’ll probably be standing in the middle of the cage with his arms raised in much-deserved glory.